changing behaviors and habits; and uncovers your inner truth and life direction while stimulating the intuition. Everyone can do it. Do you want to unlock your highest potential, experience many types of guided imagery first hand, and understand relevant scientific principles? Check out my schedule for upcoming workshops. “Many common diseases and health complaints can be treated directly with mind-body techniques.” reports Dr. Herbert Benson, the Harvard Medical School scientist who coined the term “relaxation response” 35 years ago. He states that “study after mind body study, carried out with the most careful scientific protocols, produced incontrovertible evidence that the mind can indeed influence – and heal the body – even down to the genetic level.” Along with appropriate medical care, mind body techniques are used for health improvement and can eliminate problems associated with anxiety, depression, high blood pressure, insomnia, PMS, menopausal, peri-menopausal and breast cancer hot flashes, nausea, pain, premature aging and other disorders to the extent that stress is a factor. Now consider that 80% of all illness is either caused by or made worse by stress. In addition to the powerful and positive effects of relaxation and guided imagery on physical health, it is invaluable and reliable for tapping into one’s inner source of divine intuition and wisdom. Plus, behavior change, musical performance, sport and athletic ability can all be strengthened with the regular use of relaxation and guided imagery. It can be used to reveal inner guidance with respect to one’s life direction. Guided imagery, also referred to as creative visualization, is intentional daydreaming whose aim is to magnify the positive aspects of the mind-body connection. First, focused breathing and/or progressive muscular relaxation prepare the body for guided imagery and creative visualization. Next, the mind is purposefully guided in a process similar to daydreaming. The difference is that in daydreaming the mind is allowed to go wherever it pleases. Instead of this, the mind is directed in a specific and special manner. For example, a guided imagery exercise might ask you to focus on a setting or environment that feels safe and comfortable. This can be experienced and accomplished by mentally seeing the setting, feeling or sensing the environment, or using the senses of sound or smell. As Belleruth Naparstek says, “there are many right ways to experience guided imagery.” Get more about relaxation, imagery and meditation here. So, now what? If you want to feel your best, and even prevent or conquer long-term medical problems, it’s time to get back to your yoga, meditation, and visualization habits. You wouldn’t skip brushing your teeth everyday, would you? If you’re like the rest of us and could use some help, so either join a local class, get together regularly with like-minded people to support each other, and get your DVD’s and CD’s back out. I am delighted to offer a selection of yoga and meditation classes in the Cincinnati area. Plus, I have retreats and conferences coming up. Check out my schedule. If you prefer here’s some book and CD resources on mind body relaxation to benefit from. Click HERE to buy my Real Relaxation: Yoga Nidra CD. It’s always a blast to come together, gather around the fireplace, and enjoy yoga together. Please come and bring your friends. It’s by donation and everything collected will be given to the JSC to help them serve even more people and as a token of our appreciation. Our regular schedule begins the week of January 10. Visit this link for details on the yoga classes in Milford, OH, Anderson, OH and more. One of my favorite yoga hand positions, otherwise called yoga mudras, is the Pran Mudra. It is simple to do and very powerful. What are the benefits of the Pran Mudra? Balances and equalizes the functioning of the right and left hemispheres of the brain if you hold the fingernails instead of the finger tips of the ring and little finger. 1. Put the tips of the thumb, ring and little fingers together. Instead of touching the tips, another way is to put the thumb on the fingernails of the ring and little fingers. 4. Use it as needed for 5 to 30 minutes. As a treatment, do it 3 times a day for 15 minutes. As with all mudras, practice slow, deep and mindful breathing to magnify the benefits. 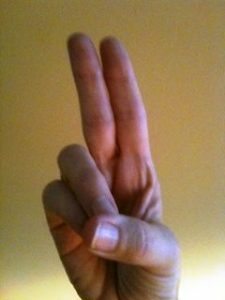 Just wanted to let you know that I’ve been frequently using the Pran Mudra that you taught us. 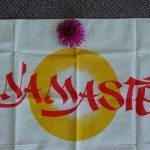 I really enjoyed how it was incorporated into our yoga postures and really felt that it significantly enhanced my practice, energy and mood that night. I’ve been using it while on my morning walks. I’m very excited! → Join us for a Yoga Mudra Workshop. Check my schedule to see when the next one is. Please share your other ideas and comments below so we can all benefit. 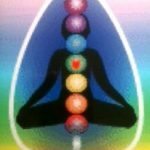 Have you ever needed the benefits from yoga (energy, relaxation, clear mind, emotional balance, etc.) but couldn’t practice a pose because you were in public, not dressed for yoga, or didn’t even know how to do yoga? This happens to me several times a day! Luckily, I have found another secret that really works. It’s Yoga Mudras – yoga poses using hand positions and gestures. I finally started taking these ancient teachings seriously while I was teaching relaxation training and guided imagery in the Bahamas last spring for the Easter/Passover Symposium on Yoga and Sacred Healing at Sivananda Ashram. Amy Weintraub (Yoga and Depression) and Joseph and Lilian LePage (Integrative Yoga Therapy) taught them as part of their presentations. This experience convinced me that Yoga Mudras are very effective, simple and profound. As soon as I got home, I began investigating and practicing Yoga Mudras more and more. One morning I was reading a book on Yoga Mudras by Gutrud Hirschi and it described amazing results and reasons to practice Yoga Mudras. The results sounded too good to be true. Since I was suspicious, I wanted to put it to the test. Meanwhile, I was suffering from seasonal allergies – my nose was running, my eyes were watery and itchy, and I was sneezing. So I tried Bhramara Mudra. It worked – and quickly too! Naturally I shared this with my yoga students and they also reported positive results too. We were so excited and it convinced us that Yoga Mudras have lots of valuable benefits to offer. There are Yoga Mudras to help with allergies, feeling calm, lifting energy, headaches, chakra balancing and many more. So, how can you learn more about yoga mudras for the hands? 2. Attend yoga classes. See my schedule. Let me know if you would like to book me for a workshop. 3. Joseph and Lilian LePage have been studying Yoga Mudras for 10 years to write a book all about them. Their book shows 108 hand gestures along with guided meditations and affirmations. I am honored and excited that they asked me to edit the guided meditations.